Pioneers in the industry, we offer solar pumps, dc solar pump and solar water pump from India. We have gained expertise in manufacturing, supplying and exporting quality-approved Solar Pumps. A trained and qualified team of professionals is hired by us to manufacture the offered range of solar pumps. These pumps work with the help of solar energy. Also, we offer these in various designs at nominal rates. 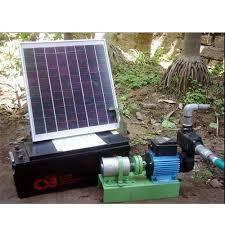 Looking for Solar Pumps ?